Why do you call HHV-6/7/8 “The Fifty Shades of AIDS Viruses”? So HHV-6 is a major public health threat? It is the biggest public health threat of our time. Only climate change is a bigger issue and maybe that is only number two considering what HHV-6 is doing to the health of the entire human race. And this isn’t about something that will happen in the future. This is about a viral plague that is going on for decades and everyone in the world may be dealing with. What Illnesses has HHV-6 been linked to? The list goes on and on because it is variable and multisystemic. You can find a lot of the illness as HHV-6 University or The HHV-6 Foundation. Is HHV-6 capable of causing AIDS? Absolutely. It was originally found in AIDS patients. Is it capable of causing Chronic Fatigue Syndrome? Sure. It was also originally found in CFS patients. That should have sealed the deal on the relationship between AIDS and Chronic Fatigue Syndrome. Can it play a triggering role in Multiple Sclerosis? Is it associated with mesial temporal lobe epilepsy? Yes. That’s why it should have been called the real AIDS virus. Can HHV-6 destroy natural killer cells? Yes. That’s also why it should have been called the real AIDS virus. Can HHV-6 also destroy monocytes and macrophages? Yes. And that is another bit of evidence that it may be related to African Swine Fever Virus, or that it behaves like African Swine Fever Virus. Has it been linked to illnesses in children? It can cause roseola, febrile illnesses and encephalitis in infants. Is it a problem in transplant patients? Does it persist in people? Well, that is complicated. The conventional wisdom is that it persists in people with impaired immune function, but since it is capable of impairing the immune function itself, it may be a problem in everyone regardless of immune status. Besides, we really don’t know what the spectrum of multisystem immune problems is in this country. Probably because the Centers for Disease Control is afraid to look. Can HHV-6 persist in the central nervous system and cause problems? Can HHV-6 cause an alteration of cytokines that leads to all kinds of symptoms? Does HHV-6 interfere with the body’s ability to fight off viruses and bacteria. Can HHV-6 stimulate other viruses like CMV, HHV-8 and EBV? Has HHV-6 been difficult to detect? Yes. The problem with testing is probably why HHV-6 has not been declared the real AIDS epidemic. Is it true that there is very little free virus circulating in the serum? Is it also true that it is difficult to distinguish between active in latent infections? Yes, and it is possible that HHV-6 is never truly latent. Just less active. That’s why it is a plague. Is HHV-6 able to integrate itself into human chromosomes? Yes, and for all we know, in animal chromosomes, too. Where in the body can one find high levels of HHV-6? In blood, sera, and hair follicles. Is it true that a significant percentage of children who have viral encephalitis have chromosomal integration of HHV-6 in the spinal fluid? Is HHV-6 integrated into monocytes and t-cells? Can one do a test on a person’s hair to see if they have HHV-6 chromosomal integration? Will a person with chromosomal integration of HHV-6 always test positive for the virus? Will someone with chromosomally integrated HHV-6 also have the virus in their central nervous system? Yes. That’s part of the tragedy of the decades of mistakes make by the Centers for Disease Control and National Institutes of Health. So, is there an increased risk for a variety of illnesses if one has chromosomally-integrated HHV-6? Can people with chromosomally-integrated HHV-6 benefit from antivirals? That work needs to be done, but because of the CDC’s refusal to admit that it is driving a major pandemic that includes AIDS and Chronic Fatigue Syndrome, that work has not been done yet. Is it true that HHV-6 can cause amnesia in people who have transplants? Yes. It results from the HHV-6 related encephalitis. Are there those who think that HHV-6 causes a kind of autoimmune disease? Yes. And one of the theories is it involves molecular mimicry in that the virus genome has certain properties which are identical to myelin protein. To the body makes antibodies against the virus and itself. That may be another thing that suggests HHV-6 is really related to African Swine Fever Virus. Or at least does a great impression of it. Is it true that HHV-6 may interfere with the ability of cells in the brain to repair themselves? Does HHV-6 incorporate myelin proteins from the infected person in such a way that it could be the cause of the symptoms in Multiple Sclerosis and Chronic Fatigue Syndrome? Is there total confusion about latent and active HHV-6? Yes. And as we said, whether HHV-6 is ever truly latent is up in the air. That’s why it is a complicated plague in a scientific Tower of Babel. Can HHV-6 explain all the problems with brain function in Multiple Sclerosis, autism, and Chronic Fatigue Syndrome? Does HHV-6 then explain the problems in the prefrontal grey matter of Chronic Fatigue Syndrome patients? When did you become familiar with HHV-6? Back in the 1980s, my newspaper, New York Native, did the most reporting of any publication in the world on the virus. Did you think it was the real AIDS virus? Absolutely. If it had been discovered before HIV it would have been called the AIDS virus. Scientists got it backwards and they kept it backwards for decades to hide their mistake. Has the CDC been covering up the HHV-6 Epidemic? These days, people in public health feel that they have the right to control information about illness, usually under the pretext of keeping the public from panicking. But that pretext can also be a mask for covering up their own mistakes. Not recognizing that HHV-6 was driving the AIDS epidemic was probably the biggest mistake in the history of science and medicine. And the CDC endangered the health of the entire planet by getting that wrong. Who did the most important work linking HHV-6 to AIDS? Two scientists. Konnie Knox and Donald Carrigan. HHV-6 is a DNA virus that was supposedly discovered in 1986 by scientists in the laboratory of Robert Gallo. There is the very real possibility that they stole the work of another virus and renamed that scientist’s virus. His name was John Beldekas and he was a scientist at Boston University. According to a report (on the internet, reference to come) "In August, 1986, John Beldekas was invited to go to the NCI and present his findings on the link between ASFV and AIDS, which he did. Beldekas gave samples of all his lab work to Gallo. Later, the government asked Beldekas to turn over all his reagents and lab work to the government, which he did. Beldekas had found ASFV presence in nine of 21 AIDS patients using two standard procedures. At the meeting, Gallo was reported saying: 'we know it is not ASFV.' How could Gallo know this as he hadn’t done any of his own tests to look for ASFV? Two months later, Gallo published an article in Science (Oct 31, 1986) that he discovered a new possible co-factor in AIDS, a virus he called Human B Cell Lymphotropic Virus which he named HBLV. Like ASFV, HBLV infected B cells and also lived in macrophages. Did Gallo steal Beldekas’s ASF virus he found in AIDS patients and rename it HBLV? Later on, when Gallo found that HBLV could also infect other immune cells, he changed the name of HBLV to HHV-6. Eventually, Gallo identified his HBLV as the variant A strain of HHV-6 and called it a human herpesvirus." What did the Department of Agriculture say about this? They said that it was impossible for African Swine Fever to infect people. But that turned out to be true. If African Swine Fever was really HHV-6, can you find it in pigs? While there has been no research on that, it is possible that HHV-6 in pigs is porcine Herpes Virus I and II. And Porcine Herpes Virus I and II could actually be a renamed form of African Swine Fever Virus. So is it possible pigs in America are infect with strains of African Swine Fever that have been renamed Porcine Herpes Virus I and II? Is it easy to play these name games with virus. Porcine Herpes Virus I and I were discovered after ASFV has been ignored or renamed in American pigs for decades. Is the naming of viruses that arbitrary? Yes, but the public doesn’t realize how subjective and political it is. Along with everything else that has to do with science and medicine. The public has not even entered kindergarten where the political nature of science and medicine is concerned. Pepole don’t have a clue. If one looks at CFS as one of the epidemiological markers for the HHV-6 epidemic, the answer is absolutely yes. Do you mean dogs and cats can become infected with HHV-6 and get illnesses like Chronic Fatigue Syndrome and all the other illnesses associated with HHV-6? In addition to his D.D.S., he was a Ph.D. Professor Emeritus of Oral and Maxilofacial Pathology and Pathology University of Oklahoma. Why did he do the study? Because there had been anecdotal reports about domestic animals belonging to Chronic Fatigue Syndrome patients who seemed to also get sick. In his study he studied mainly dogs and cats. How did he decide who was a Chronic Fatigue Syndrome patient? Did the pets generally get sick after the owners got sick? That’s what the Glass paper reports. But sometimes the patients got sick after the animals were sick, suggesting that the pets were carrying something that they passed on to their owner. How sick did the pets get? According to Glass’s paper, they got so sick that it was necessary to euthanize them. Did the illnesses the pets got resemble the illnesses of their owner? Yes, according to the Glass research. What did he find in the animals? Are people who have CFS more likely to have had animal contact than the general public? Yes, according to the Glass paper. He found that 97% of patients had Chronic Fatigue Syndrome. So people with pets are some kind of risk group for acquiring Chronic Fatigue Syndrome. What other animals did the patients he studied have contact with? Did the patients have a great deal of interaction with their pets? What was the conclusion of the studies? He focused on 343 sick pets which were owned by CFS patients. What did we see in sick pets. What was the conclusion of his study? Why hasn’t this work gotten more attention and inspired more research? It all goes back to the Centers for Disease Control that does not want to even admit to the public that Chronic Fatigue Syndrome is contagious because that would lead to research that would challenge everything they have told the public about AIDS, HIV, HHV-6, and a lot of mysterious, multisystemic diseases (like autism) that are linked to HHV-6. Covering up the fact that HHV-6 is what I call a “fifty shades of AIDS virus” is what drives the CDC’s behavior. Did Glass look for HHV-6 in the pets? No, but clearly it should have been the leading suspect. If HHV-6 can be found in the pets of CFs patients does that raise the real possibility that it isn’t a human herpesvirus but is what John Beldekas said he thought it might be, a form of African Swine Fever Virus? It certainly raises that possibility. If Glass had looked at pet pigs of CFS patients that had gotten sick, the United States Department would probably have gotten involved. Given how many different kinds of animals seemed to have contracted something from CFS patients, and given how much pigs are like humans immunologically, it seems highly likely that pigs would also be susceptible. But we eat pigs and that raises a lot of political and economic issues that are very disturbing. The idea that the CFS agent is in the food supply is the most inconvenient idea of all. You published a book about Gilda Radner’s struggle with Chronic Fatigue Syndrome? Yes, I published What Really Happened to Gilda Radner? Frontline Reports on the Chronic Fatigue Syndrome Epidemic by Neenyah Ostrom. It consisted of the first reporting she did for my newspaper New York Native. When did she start writing about Chronic Fatigue Syndrome? In 1988 and she continued doing it until we went out of business in 1997. 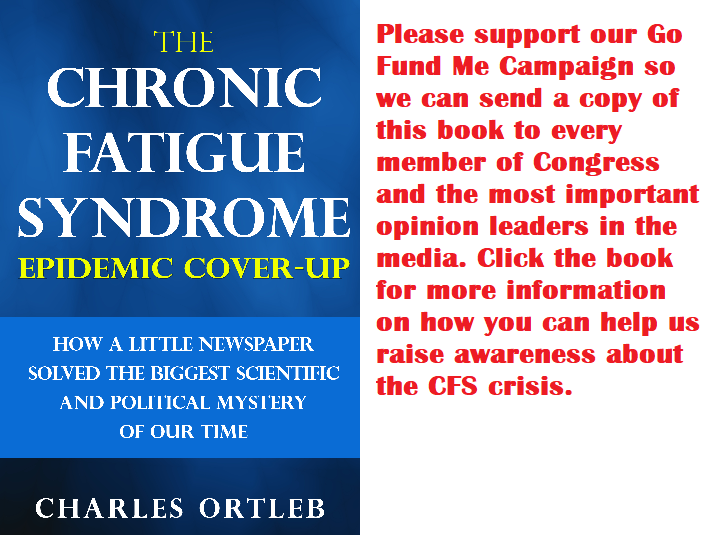 We were the first publication to give Chronic Fatigue syndrome serious and sustained coverage. Most people think New York Native deserves a place in history for giving he first serious coverage to the AIDS epidemic, but I think that the work we published on Chronic Fatigue Syndrome is just as important. And a big part of that coverage involved HHV-6. Gilda Radner died of cancer, didn’t she? Yes, but that is often the tragic outcome of Chronic Fatigue Syndrome because not only does HHV-6 cause dysfunction in many elements of the immune system, but HHV-6 seems to also be an oncogenic virus. So, one could call HHV-6 a cancer virus? When was Gilda Radner diagnosed with Chronic Fatigue Syndrome? Had the Centers for Disease Control been hearing about cancer in Chronic Fatigue Syndrome patients? Yes, but they ignored it. (Radner p. 2) Early on there was a decision made at the CDC not to take CFS seriously which makes it look like a decision was made to cover up CFS practically from the minute it began to surface in the general population. Probably because it was too much like AIDS and it threatened the CDC’s AIDS paradigm. Were there any studies by scientists outside of the CDC showing that CFS patients were at an increased risk for cancer? An outbreak in an orchestra? Does that mean Chronic Fatigue Syndrome and HHV-6 are casually transmissible? Unless the members of the orchestra were having orgies after their performances. So, you think the virus they were sharing was HHV-6? One would have to be an idiot not to at least say that it is the leading suspect. Where was the first outbreak of Chronic Fatigue Syndrome? Did the CDC go out there to investigate? Yes, but it was clear that a scientist was sent out there to basically not see anything. The fix was in from the very beginning. The data that was collected did not reflect what was going on there. The CDC just didn’t want to admit what was going on. It was weird and has never made sense unless something major had to be covered up. Back in the 80s, what was the prevalence of Chronic Fatigue Syndrome? Once you grasp the lay of the land in terms of the CDC’s cover-up of all this, nothing surprises. Is it true that Japanese researchers may have had a good grasp of what was going on with CFS back in the 80s? Yes. They published a paper in which it was called “Low Natural Kiler Syndrome.” (Radner p. 5) And they came up with an effective treatment. Why didn’t the Centers for Disease control adopt that definition and suggest that all patients be given lentinan? Good question. The best answer, again, is that something big had to be covered up. And it had something to do with AIDS and the virus HHV-6. They just didn’t want to tell the public that there was a huge epidemic of immune dysfunction connected to AIDS and a virus that they pretended was of no importance. Didn’t scientists originally think that CFS was caused by Epstein-Barr Virus? Yes, and interestingly, that was also originally thought by some scientists to possibly be the cause of AIDS. But in AIDS and CFs, it was soon clear that EBV was a secondary factor, a sentinel of the immune system indicated that something major had gone awry. Wasn’t CFS jokingly called “Yuppie flu”? Why all the jokes about CFS? I think it stems from The CDC’s unconscious fear that they had gotten AIDS wrong and this new ailment had many inconvenient similarities to AIDS. It needed to be joked away. It was like whistling pass the graveyard. And while the CDC played games with CFS, HHV-6 spread throughout the world. And, with AIDS, CFS was just the tip of the iceberg. Do scientists tell jokes about HHV-6? They don’t dare. That would open up a Pandora’s Box that would cause a debate about whether HIV is the biggest scientific mistake I history and whether it has been used to cover up the HHV-6 pandemic. Are children affected by Chronic Fatigue Syndrome? Does CFS cause learning problems in children? If HHV-6 is causing these neurological problems, could it also be behind the autism epidemic? Absolutely, and there is evidence supporting that notion. Do children with CFS get better? Is that because they are dealing with HHV-6 for the rest of their lives after they become infected? Does it affect a person’s ability to earn a living? Did Ostrom write about the discovery of HHV-6? Was Chronic Fatigue Syndrome thought to be a new entity? Did Gallo think HHV-6 was involved in AIDS? Why didn’t he think it might be the real AIDS virus? Because he had put all his chips on the HIV theory. And he had helped the government build a public health empire around HIV. They couldn’t admit they got it wrong. It would have undermined the credibility of American science and medicine. So instead they tried to say it was involved in order to hedge their bets. If the truth ever came out that HHV-6 was the real cause of AIDS, Gallo and his folks could always say we never said it wasn’t involved. They were covering their asses. Cheney, Paul R.; “CFIDS:A Real Clinical Entity (and Possible Pandemic? ); CFIDS Chroniccle, November/December 1988. P.7. Goudreau, Rosemary; “Highly Contagious Herpes Virus Linked to Cancer, AIDS”; Miami Herald, May 11, 1988, p. 1.